It's time to talk about Movie #14 of the October Horror Movie Challenge. I have to admit, I'm somewhat impressed that I've managed to maintain the momentum for this long. I think I've chosen a bunch of really good films so far, for the most part (The Demon's Rook, I'm looking at you). I've tried to balance the horrific with the humorous, mostly just to keep my palate refreshed. Tonight's film, Elvira'a Haunted Hills, definitely falls into the latter category. Does Elvira, the Mistress of the Dark, need any introduction to the folks visiting this page? I'm guessing not, so I'll just introduce the film. This is actually Elvira's second feature film, the first being Elvira, Mistress of the Dark (1988). That first film was less of what you might expect from the horror hostess, playing more like a spoof of Footloose. 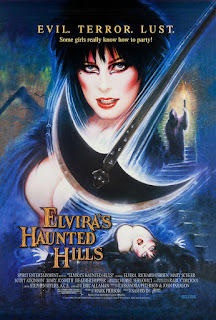 Elvira's Haunted Hills, on the other hand, is a play on the classic sort of horror films that Elvira made a career out of hosting and lampooning. All told, this vehicle felt more natural for the character than did the earlier film. If you said, for the sheer camp and Cassandra Peterson's divine facial expressions, you'd be correct! I've always liked the Elvira character, and, no, it's not just because of her sheer enthusiasm at embracing her more, ahem, ample assets. A quirky, sarcastic gothic vampire lady that talks like a valley girl and revels in double-entendres and self-deprecation - it's a firmly tongue in cheek character, that is hard not to love (Haha, "hard"). Anyway, the film is serviceable enough. Taking place in the mid-1800s, Elvira and her maidservant ZouZou get waylaid at a Carpathian castle -I'm trying my hardest not to laugh and reiterate that I used the word "laid" there- and they get caught up in a dysfunctional family curse. There's really not much to say about the plot of the film; it's just good, dumb fun. Elvira does her thing, mugs for the camera, does an almost titillating showgirl routine (the movie is rated PG-13, after all), and that's pretty much all that there is to it.